At a mere 1/8 oz. the Ultra Light Shad is the smallest, headstrong shad bait Rapala? makes. Small in size, but not in features, like a precision internal weight and a classic shad profile, the Ultra Light Shad succeeds where others fail. Running true even at high speeds, the rolling, swimming action at this small size is just the ticket when fish aren?t aggressively feeding. Slow-sinking on the pause, this antagonizingly slow sink can be more than a fish can handle, coaxing a ferocious strike. The perfect choice for small streams, rivers or into submerged rocks, a no brainier for trout and panfish. The shad profile combined with external scales, 3D holographic eyes and phenomenal finishes allows this mighty mini to be a valuable tool in a wide variety of conditions. 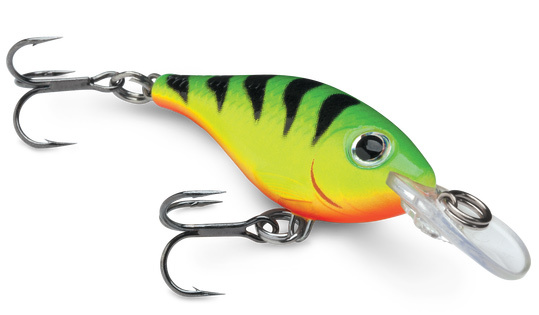 Hand-tuned and tank-tested, the Ultra Light Shad swims with legendary Rapala? action right out of the box.